L 17″ (43 cm) W 36″ (91 cm). Description: Sexes similar. 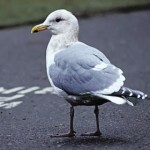 Breeding adult is gray above with a white head and underparts; dark eye; unmarked yellow bill; and black legs. Wing tips are black. 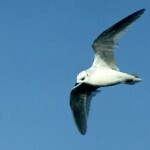 Winter adult is similar to breeding adult but head is smudged with black. First winter bird has a black half-collar; entirely black bill; black spot behind eye; and black on wings. Behavior: Nests in large colonies, sometimes numbering in the millions. 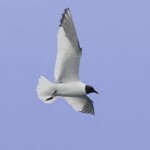 Habitat: Usually found on open oceans, and nests on cliffs. Where in Nebraska: A rare fall migrant. Most often seen at Gavin’s Point Dam. 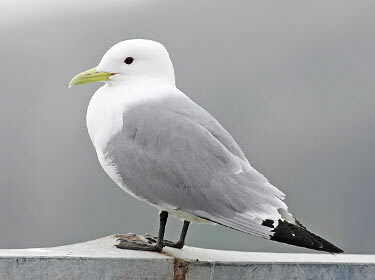 Fun Facts: The Black-legged Kittiwake is the only gull that dives and swims underwater to capture food.